This page gives you a short(ish!) tour around the most common author and journal metrics that you'll likely to encounter. In a nutshell, these metrics (e.g. a journal's Impact Factor or author's h-index) are a 'score' derived from the number of citations that academic research articles have accrued. Collectively, these metrics are referred to as bibliometrics. If you need further help, please contact the Library - libraryresearch@port.ac.uk. Related topics: The non-academic 'cousin' of bibliometrics are altmetrics, which provide a complementary measure that shows how research has been shared across social media, news sites and influenced policy. Another related topic is SciVal, which allows you to analyse metrics for any university or organisation. Why should I care about bibliometrics?! What databases can I use to look up bibliometrics? Which bibliometric measures should I select to use? How can I look up another academic's bibliometrics? How can I ensure my bibliometrics are accurate? Are metrics recorded in Pure? How does Pure relate to Scopus (and SciVal) and Web of Science? What is the problem with using Google scholar? Why should I care about bibliometrics? Bibliometrics allow you to see the amount of 'influence' that a particular journal, article, university, research group of even an individual academic has had. This is valuable to know when deciding which articles to cite, where to publish, or when identifying key universities and academics to collaborate with. For example, a common use of metrics is to produce journal rankings. This lets you see which journals are considered by the academic community to be the 'top' in your field. (See below). The future REF plans to take bibliometrics into consideration. Plus they are used by national league tables, such as the Times Higher. However, you should also be aware of the limitations of using metrics with some arts and humanities subject areas. 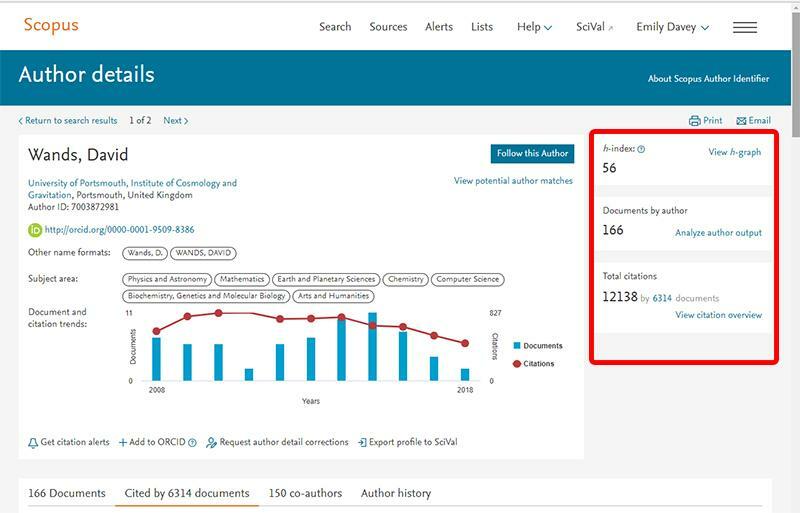 You can look up bibliometrics in the two main international bibliographical databases - Web of Science, Scopus and the associated tool SciVal. The University has a subscription to these databases. (Why should I not use Google Scholar?) Further instructions can be found below. Baskets are important when it comes to metrics! You should always try to use a range or 'basket' of metrics. All metrics are derived from the number of citations that articles receive (see diagram above). The quick reference guide gives an overview of the bibliometrics you can use, and this handbook gives an excellent and detailed guide. There are a lot of them! This raises the question of which ones should I use? Bibliometrics used to assess articles: citation count or field weighted citation impact (FWCI). Bibliometrics used to assess academic authors: the author's h-index. Bibliometrics used to assess academic journals: the journals Impact Factor or SNIP value. Always use more than one bibliometric (e.g. never Impact Factors alone to assess the quality of journals). This is often referred to as using a basket of metrics. Use the context in which the metrics are generated to judge their relevance. For example, you shouldn't use some metrics (e.g. Impact Factors) to compare across different subject areas. Plus, you should be aware of the limitations about using metrics with some arts and humanities subject areas. The Leiden principals provide a more detailed framework for deciding which metrics to use, which we also recommend that you follow. If you have (a lot!) more time, you may also like to read the The Snowball guide, which explains when each metric can (and should) be used or the recent report on the UK progress toward the use of metrics responsibly. If you need help at any point when choosing which bibliometrics us use, please feel free to get in contact with the Library team - libraryresearch@port.ac.uk. Bibliometrics can vary depending on the database they were calculated from. E.g. citation counts can be calculated from both Web of Science and Scopus, but results may differ. This is because different databases cover slightly different sets of publications: Web of Science database coverage, Scopus database coverage. Some bibliometrics are specific to a particular database. E.g. Journal Impact Factors are produced by the Web of Science, whereas the journal SNIP metrics are produced by Scopus. It's generally not advisable to use bibliometrics if you're working in the arts and humanities subject areas. This is because the Scopus and Web of Science databases do not have good coverage of publications in these areas. How can I look up my own bibliometrics (e.g. my h-index)? Bibliometrics about an individual academic includes the number of articles they have published, total number of citations, number of co-authors and so on. 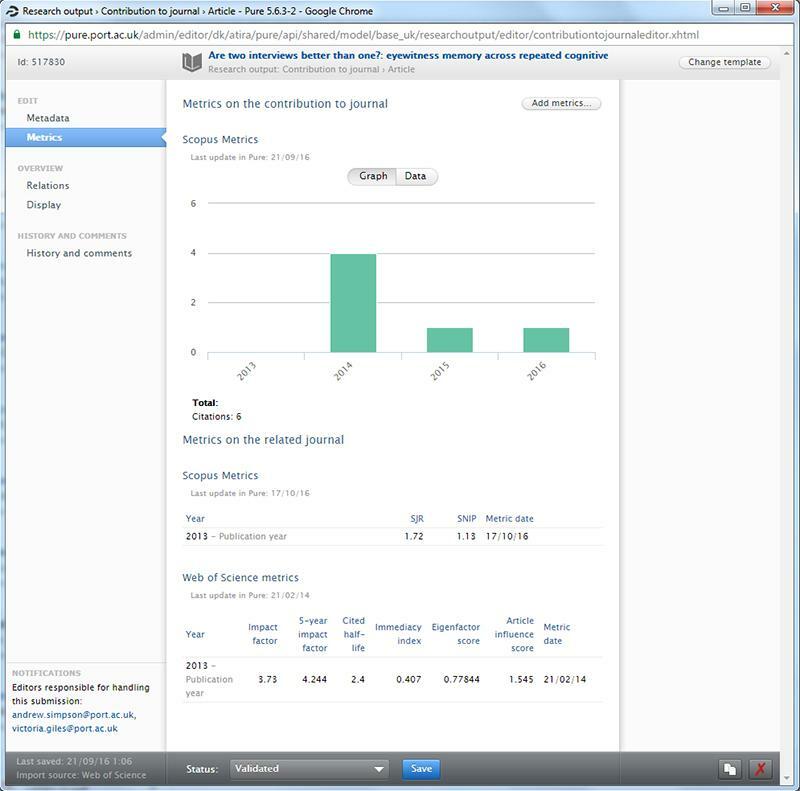 Each author has a public profile on Scopus, which displays these metrics (above). Their H-index is the number of papers (n) they have published that have n or more citations. For example, an academic's H-index is 7 if she/he has published 7 papers that have 7 or more citations each. Using Scopus: Log into Scopus and search for their name. After clicking on their name, you should see their h-index (circled above). H-indexes cannot be used to compare between authors working in different subject areas. This is because they are based on the number of citations an article receives, and conventions/norms differ considerably between subject areas. So never, for example, compare the h-index of someone working in physics to someone working in psychology. H-indexes are derived from bibliographical databases, such as Web of Science or Scopus. Although there's considerable overlap between these database, the publications they cover do differ to some degree (see above). This means that an author's h-index can vary depending on which database it's been derived it from, and so when quoting an h-index it’s important to also say the database it was derived it from. This information is in the public domain, so feel free to explore the bibliometrics of other academics, both at Portsmouth and across the world. You just need to follow exactly the same instructions as above. How can I ensure that metrics about me are accurate? 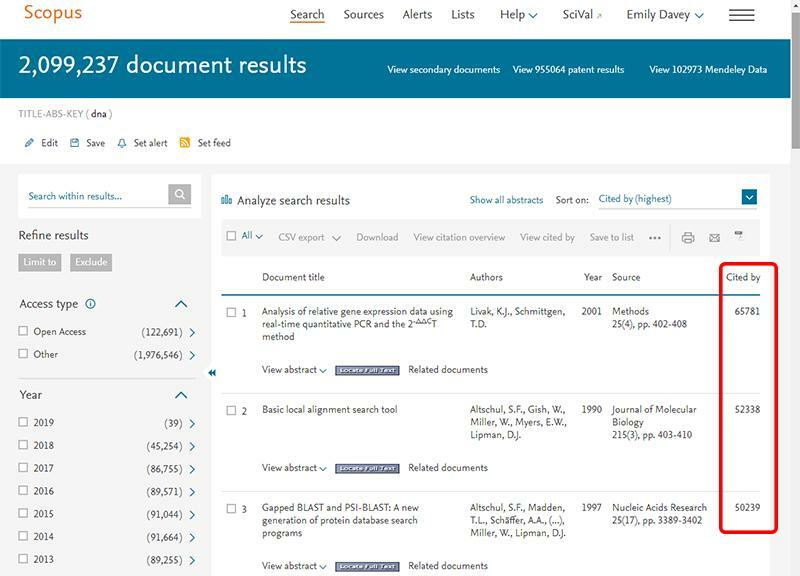 The data stored about you in Scopus and Web of Science is displayed publicly and used by both the University and external organisations. For example, this data is pulled into Pure and can be used for PDRs etc. It is also used by external organisations, such as national and international league tables, potential collaborators, future employers etc. For example, if someone wants to look up bibliometrics about you, such as your h-index, number of citations or the ranking of the journals you’ve published in, it is extremely likely that they will be using either Scopus and Web of Science. So it is important to ensure that the data stored about you is correct! You should check your public profile details on Web of Science and Scopus (see above). 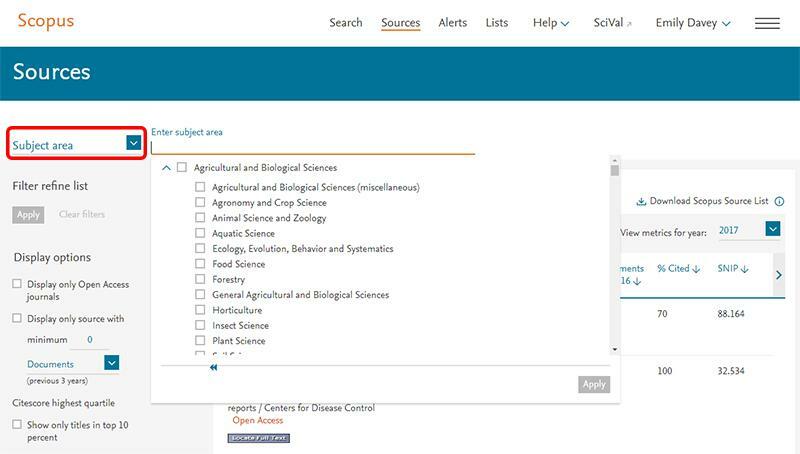 If you notice errors, then use the contact forms on the Web of Science and Scopus websites to request that they make any necessarily corrections. Please be aware that if you're working in a subject area that Web of Science and Scopus do not fully cover then the bibliometrics about you on these systems will not be accurate. For example, academics working in the arts and some humanities subject areas may find that these databases do not list all of their publications. To see if this applies to you, details of the coverage can be found here: Web of Science database coverage and Scopus database coverage. The bibliometrics in Scopus, Web of Science and SciVal are derived from the details you add to your publications. These databases run a complex 'matching algorithm' to identify which articles 'belong' to you. There are a number of things you should do when publishing to ensure this algorithm is accurate. Please ensure that you always put the full affiliation on articles that your publish, i.e. please use "University of Portsmouth", as opposed to the department in which you are based. Please get an ORCID id number, as this greatly helps to correctly linking your publications to you. How can I look up the bibliometrics for a journal? These bibliometrics give an indication of the 'quality' of a particular journal. This is useful as it tells you how journals are 'ranked' in a particular subject area, which may be helpful when deciding where to publish. There are two databases that you can use to look up these bibliometrics: Scopus and Web of Science. Somewhat confusingly, they each offer slightly different journal metrics. 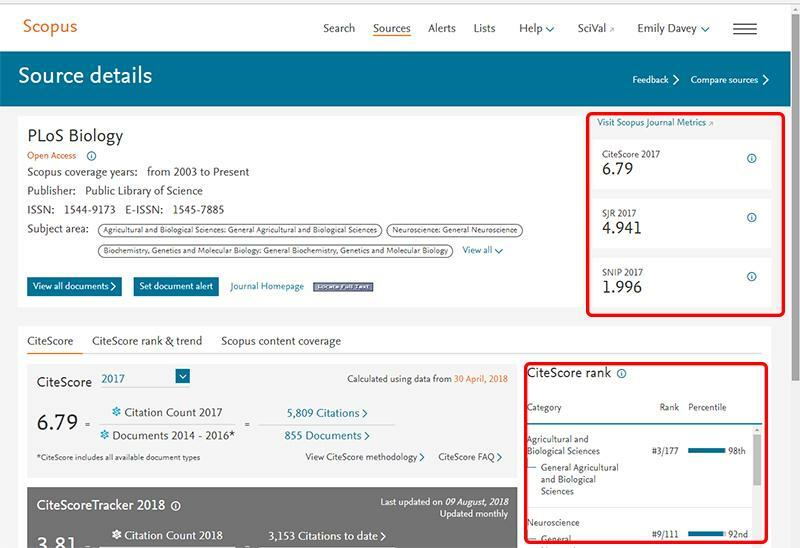 In the past the Impact Factor (from Web of Science) has been seen as the 'baseline' standard metric for journals; however, the Scopus-based metrics are now well respected. In fact the SNIP (from Scopus) is actually advantageous over the Impact Factor because it is subject-normalised and so can be used to compare across subject areas. (Please note that in addition to these metrics, the researchers in Business and Law should use the ABS Academic Journal Guide, which provides a ranked list of journals. You will need to sign-up (for free) to access the list. Also, please read the limitations about using metrics with some arts and humanities subject areas). Source-Normalized Impact per Paper (SNIP): "Source Normalized Impact per Paper (SNIP) measures actual citations received relative to citations expected for the serial's [journal's] subject field." This metric is subject normalised. This is a useful metric to use. CiteScore: This is a simple measure which shows the "average citations received per document published in the serial [journal]", calculated over a 3 year period. This metric is not subject-normalised, so you cannot use this metric to compare journals across different subject areas. CiteScore is essentially Scopus's answer to the Web of Science's Impact Factor. The difference being that the CiteScore looks at all documents in a journal, including editorial pieces, comments etc, whereas the Impact Factor excludes these. SCImago Journal Rank (SJR): "SCImago Journal Rank (SJR) measures weighted citations received by the serial [journal]. Citation weighting depends on subject field and prestige (SJR) of the citing serial." This metric is not subject-normalised, so you cannot use it to compare journals across different subject areas. Click Sources (top of screen - see above). Then click on the drop-down menu that's near the top-left of the screen (see screen shot above), and select 'Title' or 'ISSN'. Search for your journal in the box that says 'Enter title' / 'Enter ISSN'. Click on the journal title to open its profile page. It should look similar to the screen shot below. On the right hand-side of a journal's profile page (see screen shot above) you can see how journals are ranked within their subject area according to their CiteScore metric. Click Sources (top of screen). Click on the drop-down menu near the top-left of the screen, and select Subject area (see above). Then select the subject area from the drop-down menu that appears. You can then browse through all the journals within a particular subject area. This is very useful if you want to find the 'top' journals in a particular subject area. Journal impact factors (IF): A simple measure which shows the average citations (in 2 year window) received per article published in a journal. This metric is not subject-normalised, so you cannot use this it to compare journals across different subject areas. Log into Web of Science. 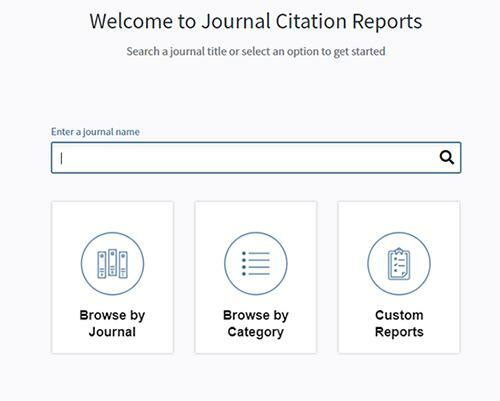 Click on the Journal Citations Report tab (top-left). Search for the journal, and select the one you’re interested in. On the journal's profile page, click on a category (top-right). The next screen will show all the journals within this subject area / category. By default they are ordered by Impact Factor, and you should be able to spot where the journal you’re interested in falls. The screen that appears will show all the journals within this subject area / category. How can I look up the bibliometrics for an article? The citation count is the number of times an article has been cited by other academic research. To find this in Web of Science please see the Web of Science library guide. 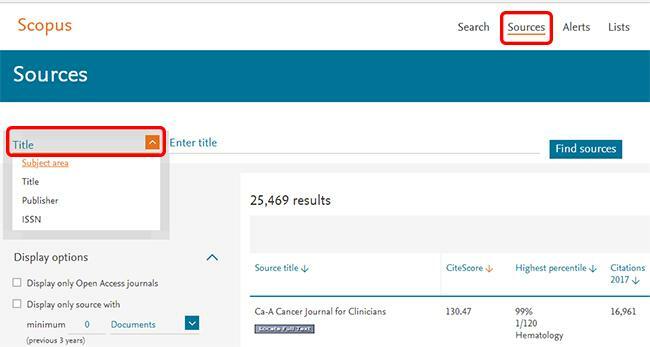 In Scopus the citation count is shown on the right of the article (below). You can also see the citations in Pure, using the Metric tab as per the screenshot of Pure below. Google Scholar also gives a citation count, though it's important to be aware of the limitations of Google scholar outlined below. Are bibliometrics also recorded in Pure? 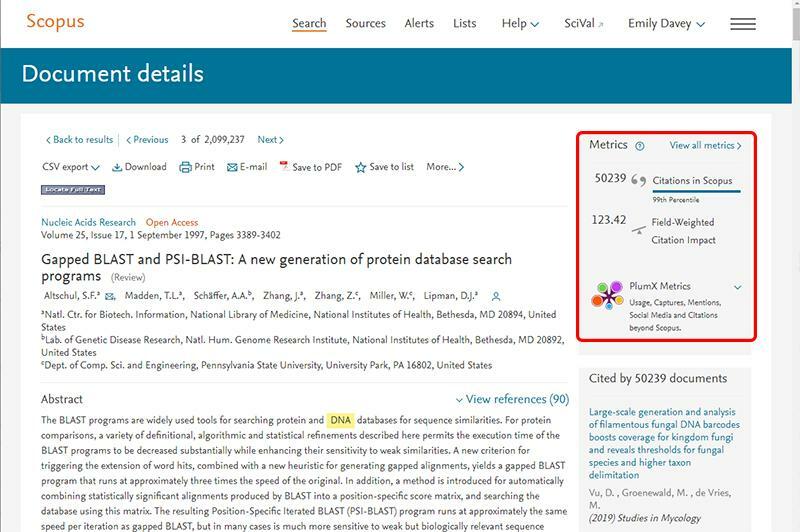 Yes - Pure automatically pulls in metrics from Scopus and attaches them to articles in Pure, for example the number of citations received and the metrics for the journal. To view these metrics in Pure, open the output record and click on metrics in the left-hand menu (below). These systems have different purposes. Pure is an internal University of Portsmouth system, which holds details (and increasingly the full-text) of the publications produced by Portsmouth academics, along with detailed information about other aspects of their research, such as funding, impact, press coverage etc. The purpose of Pure is to manage and promote the research activities taking place at Portsmouth. Conversely, the main bibliometric databases (i.e. Web of Science, Scopus and SciVal) are international databases, which hold data about publications produced by academics across the world. Unlike Pure, they do not cover the other aspects of the research life-cycle, and nor to they hold a copy of the full-text. Therefore, each university now has its own Pure (or equivalent system), while also having subscriptions to Web of Science, Scopus and SciVal. However, to integrate the systems, we now pull some metrics into Pure from Scopus and the Web of Science (see above). This raises the question of whether we actually need to look at Scopus, Web of Science and SciVal directly or whether we can just look at the metrics via Pure? The answer is that if you just want a quick look at specific metrics on a particular article then you can look at them via Pure (see above), but if you want to explore the metrics in any depth (e.g. to answer the questions covered on this page) then you do need to go into Scopus/Web of Science/SciVal themselves. When explaining bibliometrics, a common question is how does Google Scholar fit in? There is nothing wrong with using Google scholar to find research, but it's useful to know its limitations. Unlike Scopus and the Web of Science, you do not know how Google Scholar is generating its search results, and so you need to judge the validity of the sources for yourself. Google Scholar doesn't necessarily enforce the same quality control system as Scopus or the Web of Science and as a result it can index low quality sources. This can, in turn, artificially inflate its citation metrics. So the same bibliometrics can (incorrectly) be higher when generated from Google Scholar, compared to Web of Science or Scopus. Also, bibliometrics aside, while Google Scholar searches some of the resources that the Library subscribes to, it does not cover them all. So relying on Google Scholar alone could mean you miss out on things. Google Scholar also does not have the number of options for refining your search as Scopus. Finally, it is worth mentioning that having a profile on Google Scholar can also be a valuable way of promoting your work. However, please be sure to either set up your profile using a personal email address, or if you leave Portsmouth make sure that you change the email address to your new institution before your UoP computing account is removed. 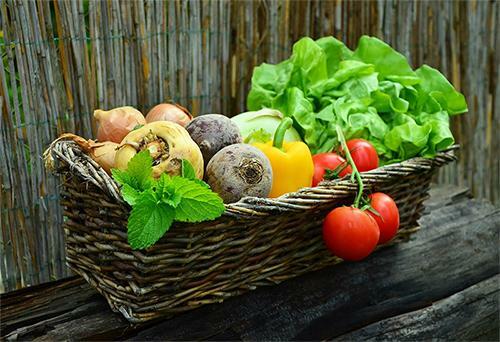 Basket image reproduced with permission from Pixabay. Building icon reproduced with permission from Flaticon. People icon reproduced with permission from Flaticon. Journal icon reproduced with permission from Flaticon. Article reproduced with permission from Flaticon.